I’ve been a little slow in writing up this post because I’ve had a lot of other things vying for my time. While I did play pretty heavily over the weekend, reaching level 34, I haven’t had a lot of time for anything other than pet battles (thanks to the great new patches put out by 7D2D). Duskwood was a pretty neat zone to quest through. I especially enjoyed learning about the Worgen, and all the dark, creepy scenery. Morgan Ladimore’s story was poignant to me – my monk currently carries his blade now that I’m trying out dual wielding. I’m not sure who Abercrombie thought he was fooling, or why my monk continued to bring him all the stuff he needed to complete his… project. I also enjoyed following the rather tragic storyline of Tobias Mistmantle and his missing brother. All pretty strong quest lines that kept me interested in this zone, along with the atmosphere. Eventually, however, I moved beyond Duskwood into the Northern Stranglethorn. This was the first really quest-grindy zone I’ve encountered so far. I’m seeing a bit less of an overarching, hand-holding questline than I did back in earlier zones. Instead, I find the typical quest hubs littered with many “!”. There were sooooo many “Hunt 20 tigers/raptors/panther” quests in this zone! And then after that, hunt 10 of them. And then 5 of them. And then the king of tigers/raptors/panthers. Okay. So these quests were “hidden” with the premise that you were supposed to be proving your worth to the hunters in Stranglethorn. But really. This was the first time I felt blah about a quest hub so far. The one quest line that saved this zone for me was the raptor quests. 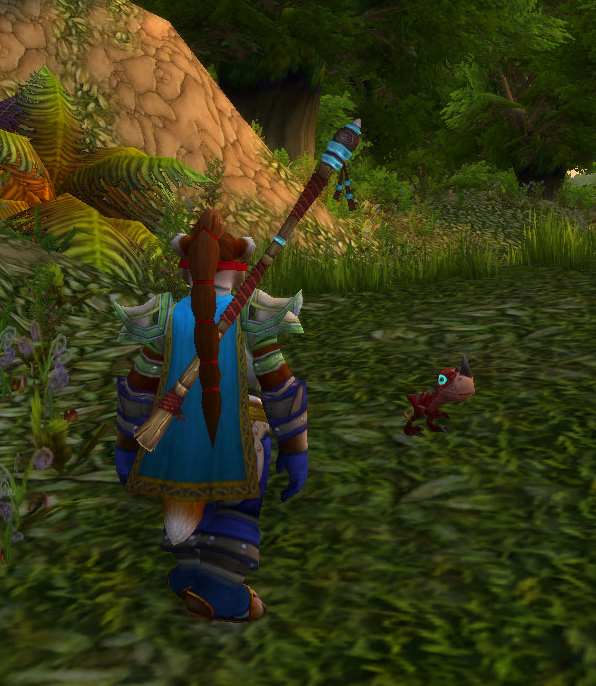 Early on, I discovered a baby raptor who took a liking to my monk. The moment I saw her, I was like, “Can I keep her! I want that!” She followed me around, I cared for her, she assisted me in locating things for quests, and initiated new quests through her discoveries. Then, later in the zone, she was taken away from me by the troll antagonist. This made me sad. My monk went through great lengths to try and rescue the little raptor, even using the bond between us to see through her eyes. The neat scenario in this zone was “raptor play” where you were able to control the baby raptor and assist her in an attempt to escape from the troll camp. Sadly, the attempt failed, and an NPC basically told me that there was nothing we could do to rescue her until more backup arrived and was organized to infiltrate the camp at a much later time. That cut the questline right there for me, leaving me a little disgruntled. So I did some research and discovered this becomes a higher-level raid instance, and that you can earn the raptor as a mount within the raid. Part of me was disappointed – I wanted to keep the raptor. Another part thought it was neat, because within the time it takes to level up to attempt the raid, the raptor grows up to become a mount. A neat feeling of time passing. I’ve read that monks can solo this raid eventually, so that’s a future goal for me. Get my little raptor back! I moved beyond Northern Stranglethorn into Cape of Stranglethorn, where I last left my monk, and will pick up next. Leveling has slowed down for me a bit since I’ve almost outleveled the zones I’m working through at this point. My monk is level 34, and Cape of Stranglethorn is level 30-35. This also allows me to breeze through most the quests without much trouble. Monk is incredibly powerful with the Touch of Death skill, to be honest. I haven’t met a boss enemy so far that I can’t automatically down in three hits, thanks to it. I went with the Windwalker specialization to start with. Though I have another specialization I unlocked at level 30, I haven’t explored it yet. I’ll likely pick Brewmaster for that as I heard it’s an excellent solo tank. The folks in WoW are an interesting bunch. So many times, I’ll be minding my own business when another player comes by, stops and takes the time to wave to me for no reason. Maybe they’re being friendly, or maybe they’re just happy to see another low level player in the low level zones. While these zones are not completely abandoned, they also aren’t super populated. Either way, it’s nice to have that acknowledgement, especially coming from other games where I rarely even get a wave from a guildie sometimes. I’ve taken a short break from WoW this week, but I hope to get back into it soon and see what the new zone has to offer! Previous Post How’d You Fare During the Steam Exploration Sale 2014? 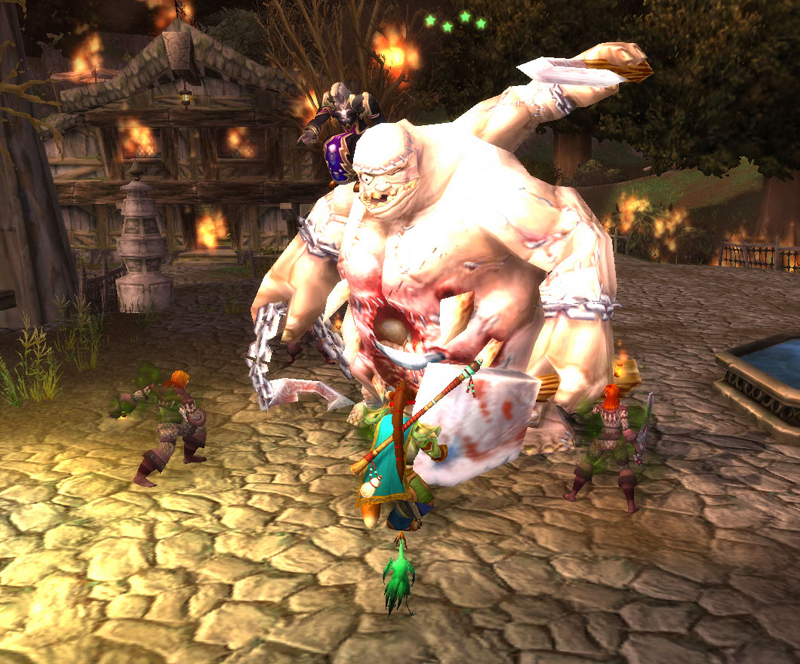 It used to be a single, rather large zone for level 30-45 and for many Alliance folks, the first zone where the Horde also had quests, getting the PvP started (at least, on the pvp servers). As a large jungle with plenty of places to hide, my first time in Stranglethorn definitely was one of the most interesting and fun times in the game. Sadly, later the zone became notorious for high level gankers looking for easy kills and questers started to avoid the place as much as possible. The raptor mount was introduced (as a rare drop) a bit later in the game, when the raid there was opened, and there was no baby-raptor quest. It’s a really cool addition to establish a real connection to that mount. The player behaviour you see is probably because you’re playing on an RP server. I’ve never spent much time on an RP server, but overall enjoyed the experience as it seemed to attract more mature players (Yes, the term ‘Barrens Chat’ stems from WoW) and a more immersive exsperience, even if it’s just because players acknowledge each other’s existence with a simple /wave. Worgen druid would be a great choice – they have nice animal forms. I’d pick that if I didn’t already have it set to have a Worgen Death Knight. I’m tempted to remake my Human Warlock… and my Night Elf Druid, and my Shaman and my… I should probably stop myself there. I was really surprised when they made worgen a playable race. They had always been antagonists in the game, although more because of a curse than any real malice. …I guess this is a recurring theme in the Warcraft universe.